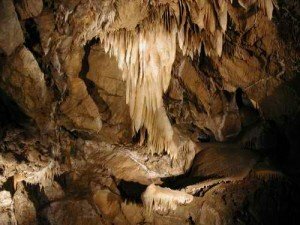 The Sierra Foothills are home to a number of cave systems — California Cavern, Moaning Cavern, Mercer Caverns and Black Chasm Cavern. Designated a National Natural Landmark by the National Park Service in 1976, the cave opened for guided walking tours in the fall of 2000. Part of the beauty of this cave is in how it has been developed using an ecologically friendly platform, stairs and walkway system that enhances rather than detracts from the underground experience. This attractive trail system keeps visitors off the fragile floor of the cave while affording them spectacular views. The 50-minute guided walking tour will take visitors through the cavern’s several unique chambers and spaces — from the Collossal Room with its brilliant turquoise lake, to the Landmark Room with its spectacular display of stalactites and sparkling white helictite crystals. The Labyrinth tour takes visitors through a labyrinth of incredible natural bridges and tunnels to witness some fantastic rock formations as they navigate through such intriguing spaces like the Marble Corridor, Madrone Alley, Treasure Cove, Jason’s Chute and Dead Man’s Drop. While the walk-tour is suitable for folks of all ages and abilities, the 3-hour Labyrinth tour is a bit more physically challenging and involves hiking, climbing, crawling, and sliding through the ancient cavern. Black Chasm Cavern is justly famous for its variety of formations including stalactites, stalagmites, flowstones and the vast arrays of rare helictite crystals. Yet these incredible natural formations aren’t the only source of fame for Black Chasm Cavern. The main chamber of Black Chasm was used as a model for the Zion cave in the second and third Matrix movies. For those who’d rather stay above ground, the Zen Garden Hike is a self-guided walk through the gorgeous landscape of standing stones. The cavern is actually situated in a unique environment that is actually a transition zone between two ecosystems, resulting in a wide variety of plant and animal life. For the wee ones, there’s the oh-so-fun chance to become a junior prospector as they mine for gemstones and pan for gold.